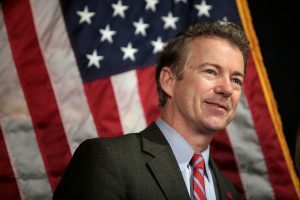 Sen. Rand Paul (R-Ky.) said this morning he will not vote for a year-end continuing resolution to keep federal government going if it permanently reauthorizes federal surveillance regulations without strong protections to shield Americans from snooping. Paul was one of a bipartisan but small group of senators who gathered at a press conference today with privacy activists from both the left (the American Civil Liberties Union) and the right (FreedomWorks). The coalition hopes to keep lawmakers from quietly renewing surveillance authorities under Section 702 of the Foreign Intelligence Surveillance Act (FISA) Amendments without any public debate. On hand alongside Paul were Sens. Mike Lee (R-Utah), Patrick Leahy (D-Vt.), Steve Daines (R-Mont. ), and Paul’s regular across-the-aisle partner in fighting unwarranted surveillance, Ron Wyden (D-Ore.). I have been an advocate of the Constitution and the Bill of Rights since my inception into this life, given to me by our Creator. What God has given me is freedom and liberty and not the chains of oppression. But in order to retain those gifts of life, we as a people of the United States of America must zealously protect and defend our liberties against all enemies. Section 702 of the FISA ( Foreign Intelligence Surveillance Act ) should be repealed. Our Constitution and the Bill of Rights is our savior against an oppressive government, and to sentence all enemies of our Republic into damnation. Even as a left-leaning independent, I am seriously tempted to like this guy. NOBODY is perfect, & in today’s disgustingly unpatriotic & divisive hyper-partisan political divide, ANY kind of effort at bi-partisanship deserves to be acknowledged & applauded. THIS is the man who should be the president!